Once a virus enters host cell, different type of sensors recognize the intruder and active a signaling cascade leading to the expression of several hundreds of genes leading to the establishment of the antiviral state briefly described below. A lot of viruses encode proteins to counteract the antiviral state to be able to efficiently perform their replication cycle (including genome replication and budding). For example, the host PML protein is targeted by many DNA viruses that need to subvert the host nucleus to replicate their own genomic DNA. Other viruses target host tetherin whose function is to prevent budding of viruses and thus their spread. MX1 (MxA) CVB, Influenza, HCV, HPIV3, LACV, MV, SFV, THOV, VSV primary transcription? nucleocapsid shutling? formation of highly ordered oligomers? MICA or MICB activates NK cell to induce lysis of host cell. 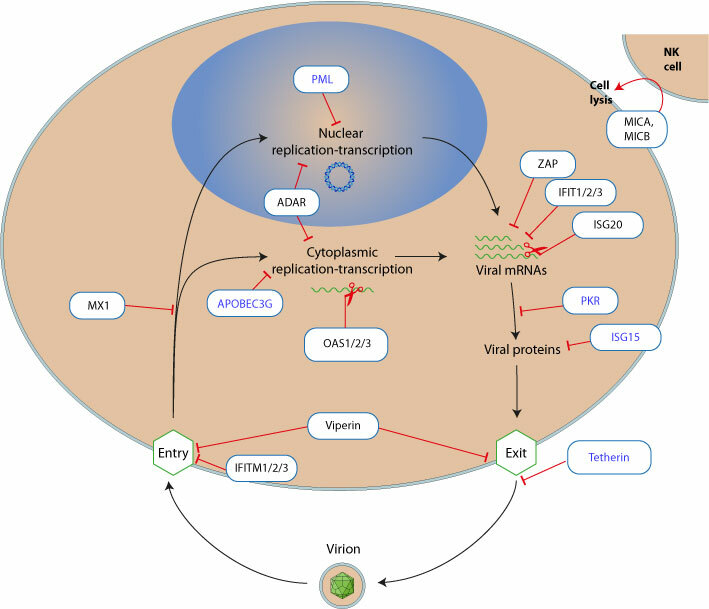 These genes are regulated by miRNA, and herpesviruses inhibit its function by similar miRNAs.